The front has always mattered and always will. But is web designing all about the website’s appearance? We think not. The entire user experience depends on the design’s feasibility, features, and flow. Web Designs have had a complete makeover in the last two years and there is a lot that can still be done to enhance the performance of digital business fronts with apt visual technology. We, the designers of Huptech never leave any stone unturned to create top-notch designs which complement the ideology of the client’s business with a creative edge. As 2017 is about to bid us farewell, our entire designing team had an analytical meeting about how this year has been for them, how have they adopted contemporary designing trends and the futuristic approach for 2018. Already tried or not, here are some amazing designing trends which Huptech Designers have tried in 2017 and are counting on in 2018! It has been a long time since we are talking about automation, Artificial Intelligence, and chatbots, and over the years, the integration of chatbots on business websites has increased. Although the introduction of the bots was clumsy, the current execution is a lot smarter and communicable due to enhanced AI. Most of the e-commerce platforms with steady sales have incorporated bots for the query solving process and it has undoubtedly enhanced the consumer engagement ratio. Human intervention is still required at some places but the future seems entirely different. In 2018, bots might become much smarter with the potency of asking more intelligent and relatable questions to the consumers and answer with much more accuracy than it is now. The seamless shopping experience with phenomenal analytical skills of the bots is already creating a strong rapport with the clients which is only going to strengthen in 2018. As for Huptech, our designers have made it a point to integrate chatbots in all our clients’ websites already in 2017 and because we believe in experimenting with self before putting the client’s front on a test, our own website has a chatbot. The beauty of this ML technology is that its design needs no space as such. It is simple, elegant, and efficient. I don’t know about other people, but fonts are extremely important for me. Even as a reader, if the content seems worth reading but the fonts are irksome, it is difficult for me to push that aspect aside and continue reading. And I’m sure there must be many who care about Sans or Serif, Gothic or Modern, etc. Typography has attracted the eyeballs of designers in this past year for what it has to offer to website designs. While we try to make minimalistic designs for the obvious loading issues, incorporating images with fancy fonts can be hurdle which usually makes the designer drop the idea. For some clients, it is crucial to stand out and have fonts that hint the purpose of their website or business. This is the primary reason for Typography gaining immense popularity recently. Businesses want to stand out with their logos especially, which is why paying a large sum of money to develop their own fonts has become much more common than it was. This trend is likely to be carried forward in 2018 as well. As for Huptech and its clients, our graphic designers are wildly experimenting with the development of custom fonts and it has certainly helped us achieve the goal of standing out and cutting out the unnecessary use of clip arts. In fact, we have had our share of compliments for the way the website layout looks when we added the demonstrative typography on flat designs. We are certainly looking forward to creating more fonts in 2018 as well. There is a reason why videos are preferred over text. Our eyes stay more alert and focused when there is some dynamic image in front of us and our minds intercept motions much better than static visuals. The web designers have used this simple fact to try the much-loved trend of using animation to create logos. Of course, they have been used liberally before for television ads, but it had its own limitations with websites because of its higher disk space need and loading time. However, now we have disk space which can coherently work with high-end designs and the designing platforms have enhanced the mapping of GUI managing the loading time. These factors have hugely contributed to the anticipated success of scroll-triggered animations. The inclusion of animations can make your website look none of its kind and they have the capacity to keep your visitors glued for much more time than usual. More than anything, your logos can tell your brand’s story in a quirky way which a static logo might not be able to convey. While we witnessed a scattered use of scroll triggered animations in 2017, things are definitely going to be intense for animations in 2018. With designers who love to stay up-to-date with the industry and a passion to create something new, our clients have had the benefit of giving the animated twist to their websites. Although we have not been able to experiment our heart out with this trend here, we have had a starter share and are looking forward to exploring more in 2018. Virtual Reality has taken the world by storm and although it is still taking baby steps in the world of web business, the time will come soon where we’ll be watching VR videos for experiencing the beauty, texture, and efficacy of the products through virtual marketing channels. The fashion industry has already taken up this trend successfully where the person can actually see how the apparels look without actually trying them. The most famous example that you’ll be able to comprehend with is LensKart. They have integrated the concept of Virtual Reality efficiently where the customer can try thousands of eye-glasses virtually. The website triggers the user’s front camera and take pictures from the front and the sides of the face and store it in the database. On selecting the frame, your face pops with that frame on. Isn’t this a designing marvel? Imagine the benefits of virtually being in the house you are planning to buy without actually being there. The positives of feeling the softness of a mattress without visiting the store! The list is endless! This trend is definitely here to stay for long and 2018 can be the year where more companies will seek the uncountable benefits of this designing technology. Sadly, we have not been able to use Virtual Reality designs for any of our clients because of some obvious issues of budget, we highly anticipate its use in 2018. There is nothing which can permanently replace simplicity, especially when it comes to designs. Of course, there can be trial and error in creative dimensions, but flat designs have taken simplicity to altogether a new level. 2017 has been a prominent time when web designers tried going crisp, simple, and elegant with flat designs. These designs are not necessarily two dimensional but its minimalistic appearance can make you feel all the space around you. Bright monotones with crisp edges, simple and elegant logos, intelligent illustrations, lots of white space, etc. have helped us to eliminate clutter from the designs which was not only taking a lot of web space and loading time but was also the reason for a bad user experience. The data light web pages with fast loading images have also helped the clients with the rankings on search engines as the bounce-rate drops drastically when you have an efficiently loading site. The best benefit though is that flat designs are a hundred times faster on mobiles than heavily designed websites. In fact, the businesses considering to be mobile-first opt for flat designs to make their medium more accessible. We too have used the approach of flat designs with many of our clients and have received the most desirable results. The clients are always happy with how the site takes just seconds to load on mobiles improving their visits and sales when compared to previous experiences. The Huptech designing team has proved its efficiency by incorporating the latest trends in this year itself which are also considered to be the trends to try in 2018. We take pride in what we have done so far as we are already ahead in the game but there is still a lot that can be done. It has been a productive year and we are looking forward to taking these designing functions to a new level in 2018. If you are stuck with badly designed websites which are not yielding enough results then it’s time for you to try these trends. The business front should be communicative and these designing trends are the perfect way to do that. We are right here to take care of everything that’s Designs! 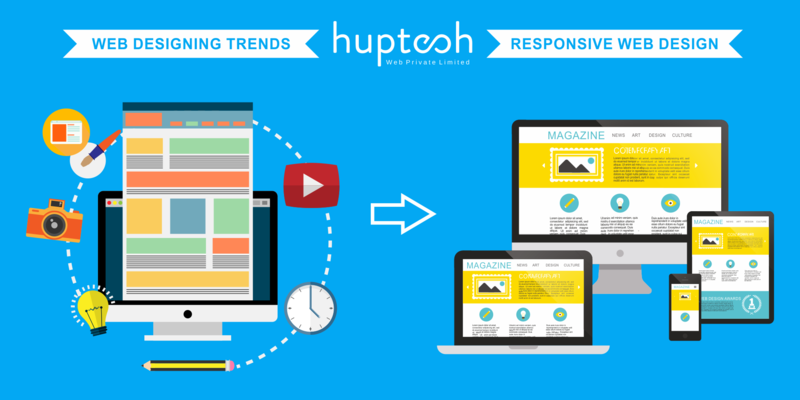 Thanks for sharing these new trends for website design. As most of the business is going online, there is the need to make the website responsive and attractive to make the visitor stay on your website for long.It is really helpful to me, I will surely implement these features on my website. Thank you. I simply want to say I am beginner to blogging and really enjoyed your web-site. Most likely I’m want to bookmark your site . You definitely come with really good posts. Thanks a bunch for revealing your web-site. I enjoy your information you actually deliver for your content articles. I most certainly will save your blog post and check out just as before in this article frequently.. web developers cv I am fairly a number of I’ll be told lots of completely new stuff suitable here! All the best . for one more! be shared across the net. Very informative article with tons of knowledge. I will share this article with my brother who is looking to start his own business and he has a nice web development skill, this will surely help him in starting and enhancing his abilities.Thanks for sharing such a great article with us. What’s up, all is going nicely here and ofcourse every one is sharing data, that’s genuinely fine, keep up writing. genuinely fastidious and the viewers are genuinely sharing pleasant thoughts. I’ve found something that helped me. Thank you! to your webpage? My blog site is in the very same area of interest as yours and my users would really benefit from a lot of the information you provide here. I quite like looking through a post that will make men and women think. Also, thanks for permitting me to comment! Someone necessarily assist to make significantly posts I might state.